Water erosion occurs when raindrops hit the soil surface and displace soil particles, and when water flowing over the land surface moves soil particles. It is a natural process often accelerated under agriculture, especially on cropped land. Water erosion causes loss of topsoil, reduced crop yields, damaged infrastructure, weed dispersal, eutrophication (algal blooms) and silting of dams and natural waterways. The averaged annual direct cost of water erosion to dryland farming in Western Australia is estimated to be $10 million, but the costs are much higher in years of severe summer storms. damage to tracks, fences and other infrastructure (Figure 1). Water erosion can be minimised in most years and situations with a combination of mechanical, chemical and vegetative measures. Water erosion in severe storm conditions is much harder to prevent. We recommend maintaining 50–70% vegetated groundcover (pasture, crop or stubble) to protect the soil surface from surface water flows. Upslope interceptor vegetation (windbreaks, tree belts and native vegetation) together with surface water earthworks prevent long runs of surface water. Reduce stocking rate or remove livestock from areas likely to erode. Grazing will remove groundcover (increasing exposure) and loosen the soil surface (increasing erodibility). Storms during summer and early autumn have highly erosive rainfalls, which can result in serious water erosion on bare, loose soil. Use herbicides for firebreaks rather than ploughing or discing. Leaving the soil undisturbed (lower erodibility) is especially important on steep slopes. On long firebreak runs downslope, we recommend small diversion banks or the start of grade banks to intercept and redirect surface water. Maintain a good soil structure by managing stocking rates, applying gypsum to soils susceptible to dispersion, or improving the soil organic matter content (e.g. through deep-rooted perennials). Surface water earthworks can control water erosion by intercepting, diverting or slowing run-off rather than permitting it to flow uninterrupted down the slope. Managers can reduce the risk of water erosion by controlling surface water run-off with grade banks and by using cropping and cultivation systems that build up soil structure and minimise exposure of bare soil. To use these options effectively, managers need to know their soil types, the basics of good crop residue and pasture management, and to manage grazing. Grade banks control water run-off by increasing the length of the flowpath, thereby increasing time of concentration or slowing the velocity (speed) of the run-off. Grade banks are placed in mid- and upper-slope water-shedding landscapes. To be most effective, grade banks should be deep enough to allow the subsurface clay to be cut and placed on the downhill bank to provide a seal against seepage. Roaded catchments and dams can, in addition to storing water, provide some buffering or retention of surface water flow if grade banks are linked into them, such as within a ‘keyline system’. Grassed waterways can also be used in some instances. Where is water erosion a risk? This topic is covered in the water erosion chapter of the Report card on sustainable natural resource use in agriculture. value of the land use. previous areas of water erosion. Taking photos of at-risk areas each year, and then comparing across a number of years, can identify slow changes in the landscape. Engineered earthworks to manage the risk of water erosion require careful planning. Poor design and construction can cause, rather than prevent, soil degradation. Suitably qualified people need to be consulted about legal aspects, design and construction. Legal aspects must be considered before surface water earthworks are constructed. Diverting water flows and increasing flow velocities or volume could cause damage to neighbouring properties, for which the drainage proponent may be responsible. Discussing planned earthworks with neighbours is recommended. In some situations, altering surface drainage by implementing earthworks requires a Notice of intent to drain which must be lodged with the Office of the Commissioner of Soil and Land Conservation. Sheet erosion occurs as a shallow 'sheet' of water flowing over the ground surface, resulting in the removal of a uniform layer of soil from the soil surface; often appears as small sediment deposits behind tufts of grass. It can occur during severe storms. It often affects areas where the soil surface lacks sufficient protective vegetation cover and there is some land slope. It contributes to rill erosion where the concentration of surface water run-off flows into deeper, faster moving channels (or rills) which follow low points through paddocks (Figure 2). It is often responsible for extensive soil loss in cultivated and non-cultivated land. Rill erosion is caused by soil detachment from concentrated run-off. It comprises numerous small channels of less than 30cm depth. 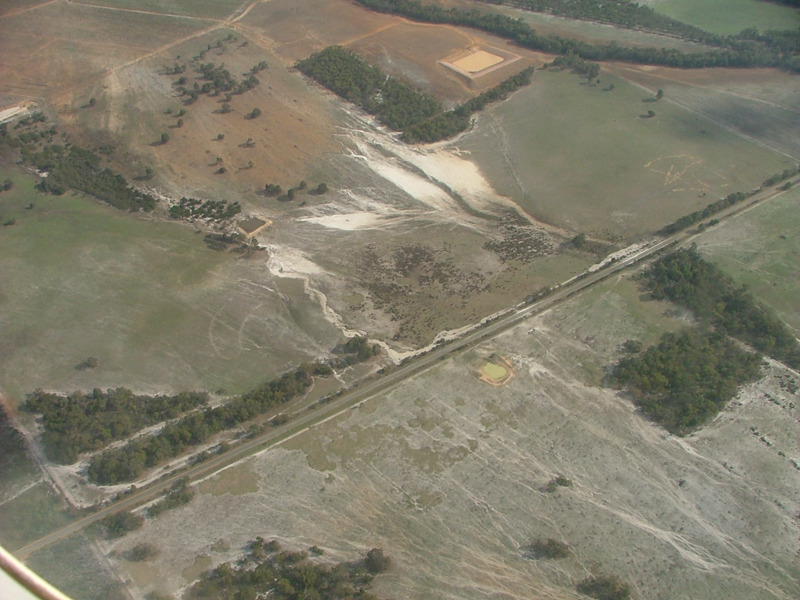 It can occur with sheet erosion, and is commonly seen in paddocks that have been recently cultivated or overgrazed prior to intense rainfall (Figure 3). It results in the loss of topsoil, organic matter and nutrients and significantly affects paddock productivity and water quality. If shallow, the rills can be removed by cultivation. Gullies are deep (>30cm), open, incised and unstable channels, sufficiently large to disrupt normal farming operations (Figure 4). 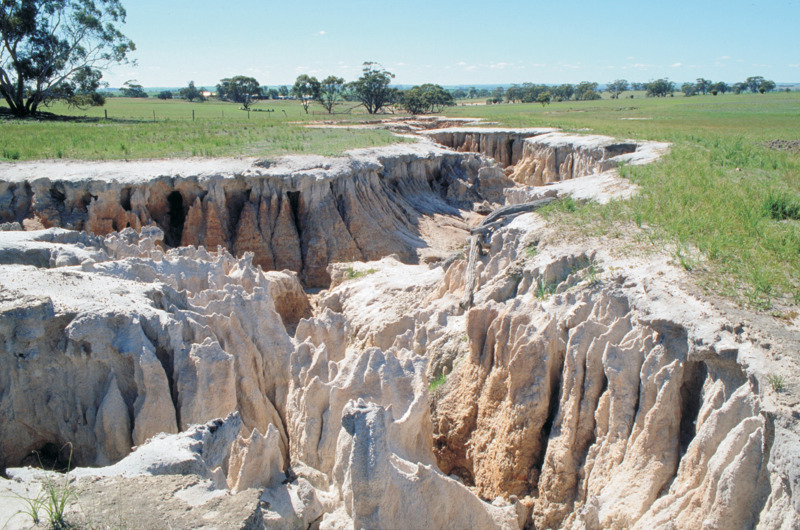 Gully erosion is a severe form of land degradation, affecting infrastructure, paddock management and property access. Rehabilitation of gully erosion is complex and expensive. If you have serious gully erosion, we recommend you seek advice before acting. See repairing gully erosion for detailed information. Tunnelling is uncommon in Western Australia, except in dispersive clays. Surface water flows into a dispersive subsoil through surface cracks, rabbit burrows, or old tree root holes, resulting in the subsoil slowly etching away (Figure 5). Tunnel erosion is sometimes seen in dam walls constructed of dispersive clay. Once formed, tunnels continue to enlarge during wet periods, eventually reaching a point where the tunnel roof collapses resulting in potholes or sinkholes and the formation of gullies. Fencing susceptible areas, diverting run-on water flow, increasing upslope (interception) vegetation cover and applying gypsum are some of the methods for managing areas affected by tunnel erosion. Figure 5 Surface water enters cracks or holes, then flows beneath the ground surface through dispersive clay layers. Gradually the subsoil clay is etched away, and when the tunnel roof collapses, potholes or sinkholes are exposed and can form gullies. See the linked pages or contacts below.